United States History, Chapter 10: Can You Win a Civil War? The first shots of the Civil War rang out at 4:30AM on April 12, 1861 in Charleston Harbor. Fort Sumter is located in South Carolina - the first state to secede from the Union. The interesting part about where the first shots were fired is that Fort Sumter was actually a Federal installation (owned by the United States government) and therefore, it was staffed by Union soldiers. In advance, the Confederates had tried to get the Union fort to surrender and leave but Union Commander Robert Anderson refused. United States History, Chapter 11: Can a Nation Rebuild After Fighting Itself? After the Civil War ended in 1865, the challenge that lay ahead before the U.S. government was how to readmit the former Confederate states that had been devastated by the war. This period that lasted from 1865 to 1877 was known as Reconstruction. During this time, although the goal under President Lincoln was to reunite the nation as quickly and painlessly as possible, it wouldn’t be as easy as a declaration of unification. United States History, Chapter 1: Were the Compromises Reached at the Constitutional Convention Fair? During the American Revolution, the colonists formally Interactive 1.2 Too Late To Apologize declared themselves free from the British with the Declaration of Independence. You learned about the Revolutionary War in fifth grade, and are free to download the fifth grade version of this resource for further review. The Revolutionary War was winding down when the colonists began work on a new government for the nation. The Continental Congress created the Articles of Confederation and sent them to the states to ratify on November 15, 1777. The Articles of Confederation served as the foundation document of the nation’s first form of government from March 1, 1781 to 1789. United States History, Chapter 2: How is the Constitution Organized to Balance Conflicting Interests? The framers of the Constitution designed three branches of government. The role of the legislative branch was to make the laws, the role of the executive branch was to enforce the laws and the judicial branch was to interpret the laws. The constitution is set up in seven sections or articles and also has an introduction called the preamble. United States History, Chapter 3: Were the First Presidents More Reactive or Proactive in Dealing with the New Nation’s Growing Pains? George Washington served the country for many years before becoming President. He was a general during the American Revolution and served as president of the Constitutional Convention, where the Constitution was written. After all that, he was ready to retire. The electoral college had different plans for George Washington though. All 69 electors chose him to be the first President of the United States of America. George Washington was the only President to receive all of the electoral college’s votes. Americans supported the choice for President and celebrated Washington as he traveled from his home in Mount Vernon to New York City, then onto the nation’s capital. On April 30, 1789 George Washington, at age 57, took the first oath of office as President of the United States under the Constitution. John Adams was his vice president. United States History, Chapter 4: To what Extent Did Presidents Following Washington Heed Domestic Policy Advice From His Farewell Address? President Jefferson’s style was very different from that of Adams and Washington; because of that, many Americans looked forward to his inauguration. As people from across the nation gathered in the new capital to listen to Jefferson’s inaugural address, many wondered if the less formal president did in fact, want to limit the powers of government. They didn’t have to wait long. United States History, Chapter 5: To What Extent Did the Presidents After Washington Follow the Foreign Policy Advice From His Farewell Address? Up to this point you have been studying the domestic issues that faced the new nation. In this chapter we’re going to study the same relative time period as the last chapter but focus more on foreign policy issues. By 1803, America was tangled in a war between Great Britain and France once again. Both countries were taking American ships that were trading with their enemy. President Jefferson tried hard to follow Washington and Adams lead and remain neutral. 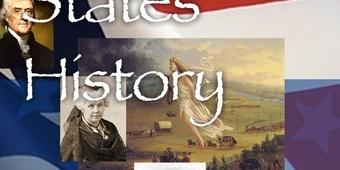 United States History, Chapter 6: How Did the Cultural Diffusion of Westward Expansion Forever Impact America’s Identity? Americans moving westward in the mid-1800s did so for a variety of reasons. Stories of rich farmland in the Oregon Territory interested many to sell everything they owned and head out for a new beginning. The flood of immigrants from Europe, along with a higher birth rate, fueled a push west as large-scale farming could help support growth in the East. The US population had grown from more than five million in 1800 to more than twenty-three million by the mid-1800s. Others looked to make it rich in the expanding fur trade and were up for the adventures of trapping. In 1849, the news of gold in California caused a mad dash for wealth. Some were curious about the mysterious West and felt that what lay across the Mississippi River might just be the change they were looking for. Whatever the reason, an estimated 4,000,000 Americans moved into the new frontier between 1820 and 1850 and in the process shaped a new identity in the American West built on ruggedness, new feelings of freedom, and a spirit of individualism. United States History, Chapter 7: At What Point Did The Issues of Sectionalism Become a Threat to the Unified and Expanding Nation? The nation continued to grow in size and wealth, each region experiencing its own different kind of economic growth which caused them to develop differently. Citizens differed across regions in their ideas of political, economic, and social progress. For the success of the growing nation, Americans throughout the country tried to compromise on their disagreements. Unfortunately, no amount of compromise could minimize the harsh growing pains the nation was about to experience. United States History, Chapter 8: Can a Few People Change Society? During the last part of the eighteenth and the first part of the nineteenth centuries, there was a growing interest in social reform, or an organized movement to improve the quality of life for particular groups of people. The motivations behind these movements were both political and religious. United States History, Chapter 9: When is it Time to Stop Compromising? Just like the industrialization that took place in the North, the geographical features of the region played just as important a role in the agrarian way of life in the South. Because geography was responsible for almost every aspect of life in the South (as it was in the North as well), its significance cannot be understated.